Everyone involved with the streetcar is beating the drum, shouting in ecstasy about how they made all rides free for the rest of the year. They proclaim with great success its viability as a mass transit option and tourist attraction. 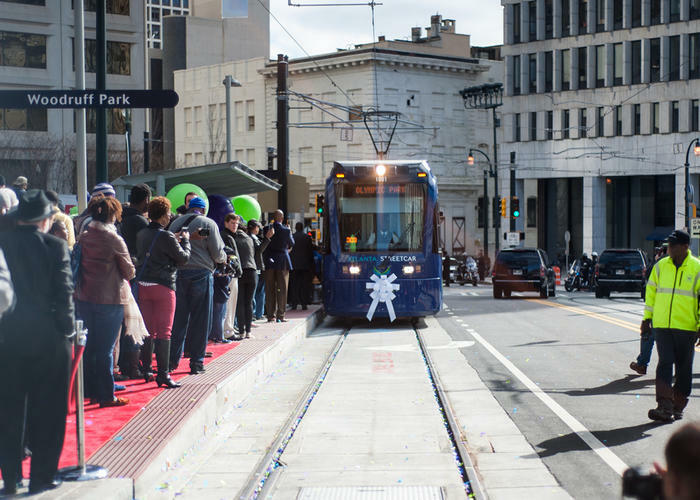 They talk about opening accessibility to the city and yatta yatta yatta… I have to stop myself from droning on because I know you read all the media hype, so I’ll give you the truth: The streetcar is free because no one is riding the damn thing. You see, the streetcar has to be a success, or else a whole administration and a whole advocacy machine will be liars. So, if they can’t get people to pay for it, at least they’ll show that people are riding it because they know the minute they charge, even a dollar, potential riders will choose to walk the 0.25 miles instead of waiting 30 total minutes for the streetcar to take them. Those po-dunk, country-bumpkin politicians are just rubbing their hands together for the failure of Atlanta. They need the failure of Atlanta. They need to tell their 457 constituents in their brainwashed districts that they fought against big business so they can sell more pick-up trucks at their full-time job at Jim Bob’s auto dealership when legislation is not in session. I digress. The fact is, the City of Atlanta is giving those haters exactly what they want. The City has invested in a transit concept that is archaic and on its way out the door. Sure, the lure of the post-War picture of Americans jumping on street cars during a period of 2% unemployment is a beautiful dream to obtain, but it’s the past, and it’s now only a dream. I’m going to bring this up again and ask a question. Please, answer to yourself truthfully: It’s August. Would you rather walk in the heat and humidity to a desolate corner in your neighborhood to wait 20 minutes for a slug to slide up the tracks, only to pay $2.50 (plus the $1.00 fee for the damn card, which is a rip) and ride the slug to another desolate corner near your job, just to get off again and walk another 4 blocks in the heat and humidity? Or, would you rather pickup a smart phone just as you’re finishing breakfast, press a button that will automatically call a car and pay the same price of $2.50 (without paying an extra fee for a damn card), and as you walk outside your home a driverless car is awaiting that will drive you directly to your place of employment? I’m going to look in the mirror myself and say that I will take the car. If you ask any robotics professor or student at Georgia Tech or MIT, or any other robotics lab and they will tell you the same thing: In 15 years our children are going to wonder why we wasted so much time staring out of a windshield and didn’t just let the car drive for us.